Histopathology associated with RT exposure and huPB10 intervention. 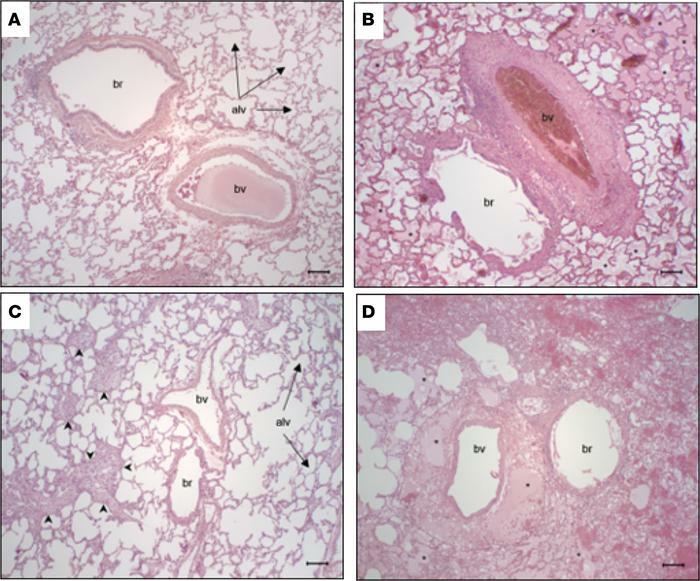 H&E-stained tissue sections of lung tissues collected from (A) healthy control animals, (B) RT-treated animals, and RT-treated animals that received huPB10 at (C) 4 hours or (D) 12 hours. Tissues in B and D were collected during necropsy from animals that succumbed to ricin intoxication, whereas the tissue in C was collected from an animal that survived RT exposure but was euthanized upon completion of the study on day 14. Tissues from (B) RT-treated and the (D) huBP10 intervention at 12 hours demonstrated severe neutrophilic infiltration of bronchioles (br), space around blood vessels (bv), and interstitium, as compared with healthy controls shown in A. Alveolar spaces (alv; arrows) of RT and 12 hour-treated animals were expanded by edema (asterisks) and hemorrhage. (C) Animals treated with huPB10 at 4 hours demonstrated multifocal areas of fibrosis and mild eosinophilic and neutrophilic infiltration (arrowheads; see Supplemental Figure 2). Original magnification 10×. Scale bar: 100 μm.